This is the third post in our 2017 NBA draft coverage. The previous two posts can be found here: Big Board, Players 1-5 deep dive. While there continues to be some consensus here (we’re all skeptical, but also kind of optimistic on Dennis Smith as we see his middle ground as Eric Bledsoe; which is pretty damn good), our comparisons for Jonathan Isaac against NBA players runs an intriguingly wide range. As always, special thanks to my fellow writers/scouts (Bug, Hamilton) and our super talented artist (Maahs). Hamilton: De’Aaron Fox emerged as high lottery pick during a solid freshman season at Kentucky in which he averaged 16.7 points, four rebounds and 4.6 assists. His head-to-head dominance of consensus top-two prospect Lonzo Ball in the Sweet 16 propelled him to 2nd tier of the 2017 draft. Fox has been compared to John Wall for his speed, and it’s possible he’s faster. He changes direction effortlessly without slowing down. While this is a tremendous asset, it can also be a problem. He has a tendency to get sped up in transition and half-court drives, ending up in no-man’s-land without a good shot, or a pass that sets up a shot for a teammate. Many of Fox’s dimes come from relatively simple drop-off passes and dishes once he has gotten by his own man. His vision isn’t doesn’t appear to be on the level of other top PGs in this class. Playmaking PGs keep a probing dribble alive and change pace while doing so. I would like to see him change pace more than he does both in transition and in the half-court; against NBA level athletes, this is a must. Another problem for Fox as a PG in the NBA will be his well-documented poor shooting. It’s one thing to have a visually unappealing jumper if it goes in. That’s not the case here. Fox’s jump shot is broke and not always for the same reason. As Draft Express notes, sometimes he shoots on the way down, sometimes on the way up. He relies too much on upper body in his shot. Sometimes he floats to his left, sometimes his balance is pretty good. The angle of his elbow is always too narrow, which makes his release more of sling, or flick, than a jump shot. The good news is he’s well-aware of this fact and answered virtually every question in his DX interview in Los Angeles talking about improving his shooting. As it stands, his unreliable shot means defenders can go under on screens and his speed is somewhat nullified at the NBA level. He also didn’t show much of a right hand at Kentucky and that’s another point of emphasis in his development. For me these factors call his position into question. I can see him developing into a slashing score-first combo guard. Defensively, he should have the ability to guard 1s and smaller 2s. If he can put on weight without compromising his speed, it could translate nicely on the defensive end of the floor for him. He’s not as polished as Markelle Fultz or Ball at this moment but his ceiling is high, and he gets great marks for his work ethic, intelligence, and character. Those things matter. When weaknesses are clear and fixable, a hard-working smart player can overcome. 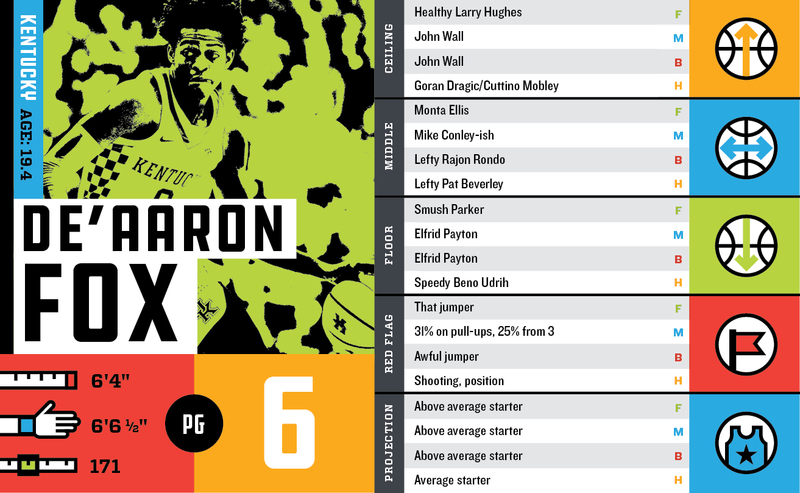 De’Aaron Fox may end up being a top-three player from this draft class, but what the finished product looks like is definitely to be determined. 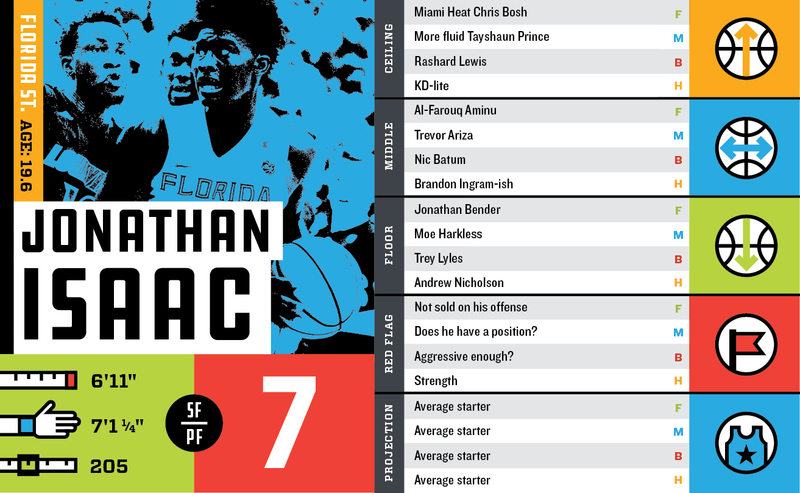 Fenrich: Jonathan Isaac of Naples, Florida, late of Tallahassee, has a bit of that Anthony Davis thing going on where he played ball in high school as a combo forward before hitting a growth spurt and jumping up to his present height, 6’11”. Like Davis, there’s a natural fluidity in his athleticism. He doesn’t move like a lot of guys near seven feet tall though it seems like young people like Davis, Kevin Durant, Karl-Anthony Towns, among others, are becoming bigger and more athletic. 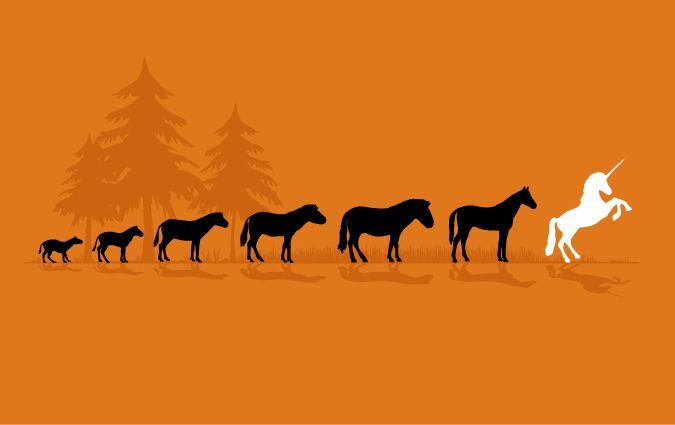 Evolution indeed. When I look at Isaac’s tape though, I don’t see the same transcendent skill so prevalent in those other players I listed (to be fair, I didn’t see it in Towns either). That’s not really a knock on a player though. Isaac moves great, he has unteachable length, appears comfortable without being the center of attention, has lateral mobility and quickness, can guard multiple positions. In short, he has a combination of physical ability and basketball skills that are ideal for today’s NBA where the ability to guard multiple positions and hit from deep are coveted. That latter piece is my curiosity with Isaac. In his one season at Florida State, Isaac took nearly three threes-per-game and hit close to 35% of them. For a guy who took just eight shots each night, to have nearly 40% of them come from deep is a curious stat. That said, his three-ball and perimeter game come naturally. He has a nice jab step, but if he’s not an outside threat at the NBA level, I’m not confident how effective it will be. Speaking of using range to set up the driving attack, a favorite method of attack for the more developed bigs in the league, Isaac’s handle isn’t anywhere it needs to be to put the ball on the floor at the pro level. At its current level, I envision his pocket being picked or him being stripped by stronger, quicker defenders than what he’s accustomed to. Concerns around his handle and how his jump shot translate aside, Isaac has the look of a natural pro defender. This is somewhat contingent on him getting stronger, but the length and agility coupled with the willingness to defend are a great foundation to build on. And I can’t imagine teams are looking at him expecting to be a number one or even number two option. That said, the NBA has a bad habit of miscasting players out of necessity. Just because Isaac can make the three and can occasionally put the ball on the floor doesn’t mean that’s what he should be doing. With any luck, he’ll land with a team patient enough to build on his copious defensive strengths and allow him to develop as a competent, but supporting offensive player. 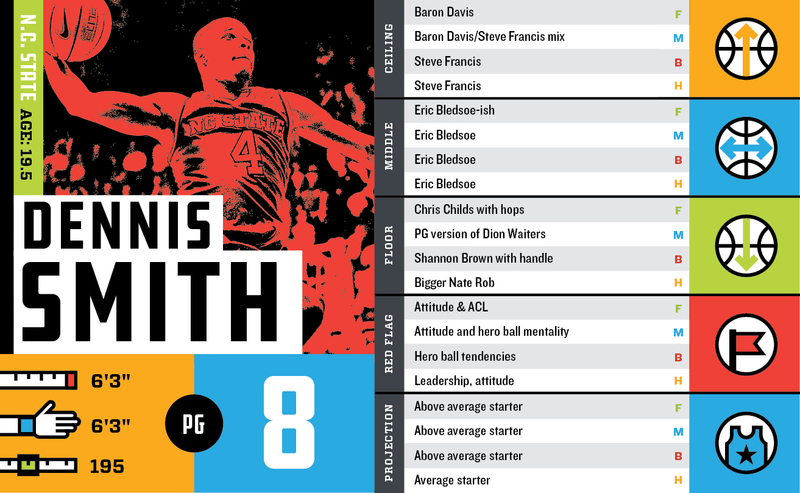 Fenrich: Mark Medina of the OC Register wrote recently that Dennis Smith “had a 48-inch vertical.” The highest vertical in Draft Express’s deep database on NBA-prospect measurements is 46” from viral dunkster, D.J. Stephens. I’m not saying Medina got bad info or that someone is embellishing here, but the iota of possibility that Smith could possibly have a 48” vertical speaks to mind-numbing athleticism and explosiveness. When I watched Smith’s tape from NC State, my first thoughts were “Baron Davis” and that he plays basketball like a football player. At 6’3”, 195lbs, Smith is built like a brick shithouse and attacks the rim like he’s relishing the contact. (As an aside, where I keep seeing Davis, it seems everyone else sees Steve Francis. I think it’s the thicker-looking build that makes me think Davis, but hey, Davis, Francis, whatever, he’s dunking on someone.) It’s one thing to see an explosive athlete dominate skinny college-level big men. It’s another thing to envision him careening into Draymond Green or Kristaps Porzingis or even Robin Lopez for the violent dunk smash. Smith showed a serviceable jumper in the NCAA where he shot close to 36% on nearly two makes-per-game. That’s a good volume, but I’m lacking a bit of confidence in the shot. He can get the pull up jumper when he wants, but his balance often looks off. On the three, he doesn’t always hold his follow-through. Similar to being a decent three-point shooter, but failing to instill confidence, Smith averaged over six assists as a freshman; a quality number, but watching his tape, there’s a glut of bad decisions made. It’s not just turnovers (he averaged nearly 3.5), but the shot selection and the seeming obliviousness of when to shoot or make a play. Smith was far too comfortable pulling up early in possessions when better options were available. Draft Express has what almost amounts to a blooper reel of Smith making the kind of decisions that drive coaches crazy (or get them fired). Probably most disconcertingly, there are numerous questions around his character and leadership. There’s a consistent lack of effort on defense, boneheaded decisions on offense, straight up looking off teammates trying to set screens, and body language that often communicates disinterest. Some of these intangibles can maybe be attributed to his environment. Like Ben Simmons last season, NC State’s program was far from stable. They fired their coach in-season and struggled throughout the year. While Fultz was in a similar losing situation at the University of Washington (their coach was fired after the season), it was stable in that the coach had been in place for several years and, despite a series of one-and-done players, a culture had been established. This is a bit of a cop out for Smith, but still worth pointing out. Despite all the concerns, I’m bullish on Smith. I acknowledge there’s a level of risk that goes with drafting him and believe he needs to land somewhere where veteran teammates or coaches can hold him accountable. In the top-ten picks of the draft, that’s not always an option. There’s a reason teams end up in the lottery. I don’t know if it’s better to have all the athleticism in the world and struggle with the mental aspects of the game, or, like his fellow draft class peer, Fox, have excellent athleticism with a great head on your shoulders. And even though I ranked Smith higher because the upside is so massive, as I write this, I can’t help but think that a good player with great character may be the better route. Watching Dirk back then, you can see the badass, but aside from say, LeBron James and Shaquille O’Neal, Kevin Durant, I can’t think of many guys you’d scout as an amateur and say, “He’s going to be a top-10 all-time scorer, MVP, and NBA champion.” As good as Dirk was in this clip, I don’t think anyone expected him to be the guy he’s become. But Markkanen is a lot of other things. He’s a big kid with a basketball pedigree. His dad player for Kansas and the Finnish national team. His mom was also a national team player. He’s a legit seven-footer with a big, broad-shouldered frame that occasionally looks even bigger because he wore big t-shirts under his jersey at Arizona. In his single season in Tucson, he shot 42% from three on over four attempts-per-game. His range extends out to the NBA level and he appears to have a strong base. He does have a little hitch when he catches on spot up threes where he’ll catch and bring the ball down before elevating into his rhythm. It’s a small thing and he’s such a great shooter that I doubt it matters but when thinking about a vastly more difficult level of competition, these split seconds matter. What the three ball opens up is the dribble drive as NBA bigs are often challenged to close out on shooters with a hand up and still defend the dribble drive. Not convinced he’ll be able to put it on the floor at first, but it should be something he develops.Sticking with the dribble drive, it was difficult to discern his ability to pass off the drive. Can he develop to the point where he can put it on the floor against a closeout defender, make a move, see the help and then find the open man? This is the type of skill level that takes a player from Channing Frye rotation-guy to Ryan Anderson-starter or better. The big differentiator with Anderson though, is that Markkanen is a legit seven-footer while Anderson is around 6’10”. Neither player has great length, but based on those broad shoulders and average athleticism, Markkanen has the potential to be a load around the basket though that appears to be unlikely given his current stylistic approach. Defensively, I’m not expecting much. To borrow from Jeff Van Gundy, so much of a defense is about effort. Is he willing to put in the hard work and effort to try on the defensive end or is he content to shoot seven threes each night? From the materials I’ve seen, there’s no indication he won’t put the work in, but it’s difficult to project at this point. What’s most intriguing about Markkanen is that he’s likely the best shooter in this entire draft class. Being seven-feet and having that type of stroke automatically lifts the floor to Channing Frye-type levels. 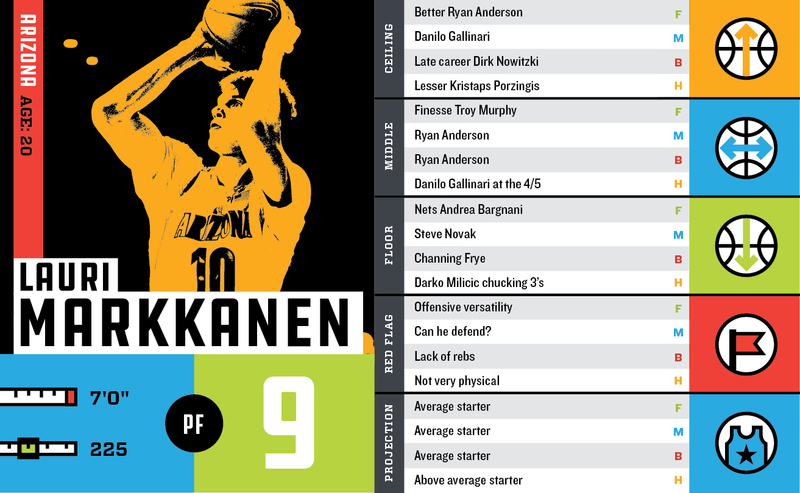 Even with the league evolving in terms of its size/skill versatility, Markkenen has the potential to be among the best shooting big men in the league. And that designation, “best shooting big man,” can mean anything from Channing Frye to Dirk Nowitzki – even though he won’t be Dirk. Bug: If you’ve never watched Zach Collins play, you might look at the stats and wonder why he’s a projected lottery pick. Ten points, six rebounds, and only 17 minutes-per-game…what’s the fuss about? Luckily for those of us that can’t keep our eyes open for those late night west coast games, we got a good look at Zach Collins in the NCAA Tournament. He had stretches during in March where he was the best player on the floor, with potential oozing from every orifice. Based on what I’ve seen from the tournament, and various clips, he has immense potential. He hits the three at a 47% clip, blocks four shots-per-game/per-40 minutes. The inside/outside game brings Pau Gasol to mind. He can bang down in the post, but also take it outside and knock down open jumpers. He compliments the offensive game with more-than-sufficient rim protection. When put in situations where he is required to guard smaller players, Collins shows the lateral movement to not be a liability in pick-and-rolls with good lateral movement for a seven-footer. Using the term “leap of faith” could be applied to most prospects, but that phrase is the slogan for Collins. I see him play and get excited, but the 17 minutes of playing time is always the footnote. Can he extrapolate his impressive stats over a full game, or did he see limited minutes for a reason? 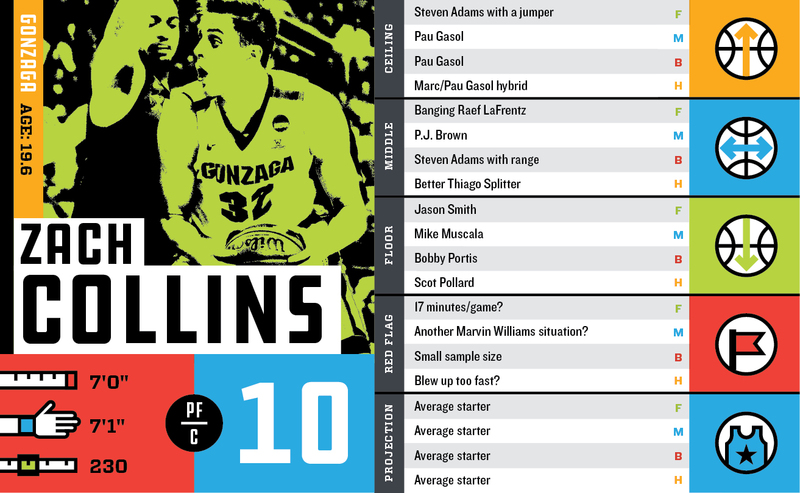 We’ll find out soon enough, but based on what I see on film, it is worth the gamble to make Collins a lottery pick.